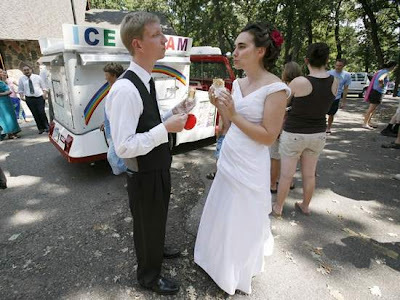 Mmm....this wedding (featured in a Detroit newspaper) makes me smile. 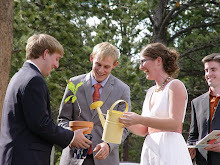 It was held on the bride's family farm. 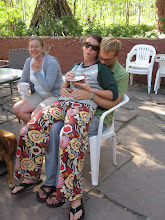 The rehearsal dinner was a simple picnic, followed by croquet, horseshoes and badminton. Later that night, they retreated to the barn for an open mic night, replete with guitars, poems, and serenades from 5-year-old nephews. So fun! I also very much appreciate and respect the fact that they have been saving money for their wedding for a few years and, with family, pulled together $9,300 for the shindig. 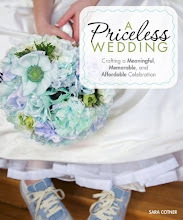 So many couples go into debt to finance weddings that are beyond their means. 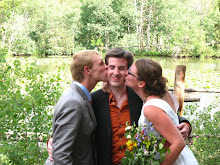 They married on a Sunday morning at a state park on the shores of West Okoboji Lake, near the family farm. They had a brunch reception for 130 guests at $11 per person. And, instead of cake, they paid $200 to a local resident to serve frozen ice-cream treats from her 1967 vintage Ford ice cream truck. What a fun surprise! The fun continued as the wedding participants changed into comfy clothes so they could swim and play more games, including Wiffle Ball. I love the emphasis on good ol' fashioned fun. 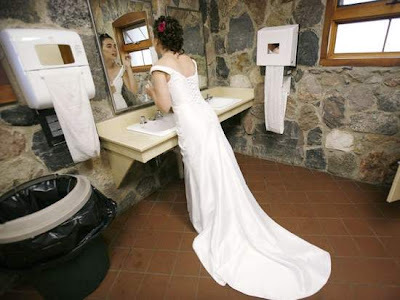 I also love the bride's seeming laid-backness (she used the state park restroom right before her wedding). The whole affair feels relaxed and fun. It seems like they created an environment that was conducive to focusing on what really matters--community, connection, and commitment. This was in CNN, I copied the article on my blog too!